ing at Palazzo Roccanera for more than a month. Though she was always eager to come to Rome, where she found the social life much more exciting than that of Florence, this was only the second time she had visited Isabel and Osmond since they were married. She complained that her husband, Count Gem­ini, gave her little money with which to travel anywhere, while Osmond had invited her to Rome on only two occasions, once shortly after he and Isabel were married, and again at the pres­ent time. Osmond found his sister something of a “fool,” felt that he and she had little in common, and therefore did his best to avoid her company at all times. The Countess, however, was enjoying her stay in Rome completely. At the sound of Isabel’s step now, she raised her head. “Ah, he was so nice. I’m awfully sorry for you,” said the Countess, throwing down her book. 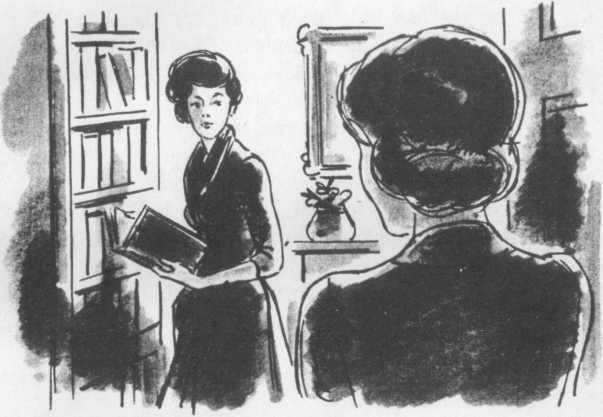 Half an hour before, Isabel would have listened coldly to the suggestion that she would ever feel a desire for sympathy from her sister-in-law, whose very artificial manners usually made Isabel feel cold to her. But now, such was Isabel’s state of mind, that she was glad even for the Countess’ considera­tion. “Yes, I’ve been with Osmond,” she said, while the Coun­tess’ bright eyes shone upon her. Isabel went to her room where she.walked up and down for an hour She was torn between her desire to see Ralph again before he died and her obligation to follow Osmond’s wishes. More than ever before she realized now what marriage meant. When one had to choose, one chose as a matter of course for one’s husband. It was not Osmond himself that she feared, if she decided to go away. What he thought of her she already knew; what he was capable of saying to her she had felt. But they were married, and marriage meant she should stand by him, no matter what the circumstances. To go away now Would be to break violently with all the traditions of married life she personally had always held so dear. She sank down in a chair and buried her head in her hands. “Yes, but I don’t think you can comfort me,” said Isabel. her sister-in-law might say something human as well. What the Countess told her, of course, proved to be not only human but also far more important than anything Isabel could pos­sibly have expected. While Isabel listened, the Countess went on to say that her first sister-in-law, Osmond’s first wife, had died three years after her marriage to Osmond without ever having borne him a child. Pansy was Osmond’s daughter all right—but by another wom­an. This woman was Madame Merle. She and Osmond had been intimate for some seven or eight years. The facts of the child’s birth had been neatly concealed by making it appear that Osmond’s wife had borne the child just before she died. Osmond and his wife had been living originally in Naples; later they went to Switzerland when the wife became ill. The wife died while there, but Osmond stayed on in Switzerland for some time, never returning to Naples. Then it was, by a re­arranging of the dates, that the whole later history of Pansy’s birth was set going, and the impression given that the child had been born just before the death of the first Mrs. Osmond. The Countess went on piling up detail after detail, which Isabel,.in her emotional state, had difficulty in following. But she tried to listen closely and even managed an occasional ques­tion. Why had Osmond and Madame Merle never married? she asked. The Countess drew a quick breath and went on to explain that Madame Merle did not have a sufficiently large fortune to attract Osmond into marriage. Madame Merle too, for her part, hoped to marry a greater man—that had always been her idea. She was ambitious, she had waited and watched and plotted—but had never succeeded. Yet she had never com­pletely failed Osmond either; she had been faithful in her way. She had brought him and Isabel together, and also arranged in this way for Pansy to have a mother who could give her the comforts of wealth which neither she nor Osmond had been able to provide. Isabel started a little; she turned away. Various thoughts were crowding in upon her. Now she understood many things she had been unable to understand before—but they brought her pain, not relief. She got up, stood a minute so, but felt weak and had to lay her arm upon the chimneyplace for support. She then dropped her head upon her arm—her eyes closed, her lips were pale. “I’ve done wrong to speak—I’ve made you ill,” the Coun­tess said. “Ah, I must see Ralph,” Isabel cried—not in anger, not in the quick passion the Countess had expected her to show, but in a tone of deep and far-reaching sadness. A. 1. How did Isabel feel after she left Osmond? 2. Why didn’t the Countess Gemini visit the Osmonds very often? 3. What did the Countess guess that Osmond had said about Ralph? 4. Why was Isabel torn between Ralph and Osmond? 5. Why did the Countess decide to help Isabel? 6. What did the Countess say about Osmond’s first wife? 7. Whose child was Pansy? 8. How had they arranged to make people think that the child was the first Mrs. Osmond’s? 10. What had Osmond and Madame Merle agreed to do for each other? 11. How did Isabel feel after the Countess had told her these things?